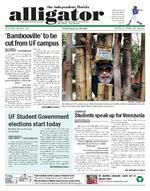 ALLIGATORSell your old stereo, cell phone, and more in the Electronics Section of the Alligator Classifieds. 373-FIND In the market for a new set of wheels or just looking to add a second to that collection? Want personalized handlebars or a fitted seat? Check in the Alligator Classifieds UF Surplus On-Line Auctionsare underwaybikes, computers, furniture, vehicles & more. All individuals interested in bidding go to: SURPLUS.UFL.EDU 392-0370 4-23-14-72-10 Guitars and Musical Instruments New, Used and Factory Refurbished Check Us Out Before You Buy or Sell!! Leonardo's Music, Micanopy, FL 352-450-0928 Leonardos302.com 4-23-14-72-10 Party Supplies: Complete line of Bar Supplies, glassware, Liquor Pours, Shakers, Professional Cooking Utensils. R.W. Beaty Co. 1120 N. Main St., Gainesville 352-448-3433 beatyequip@aol.com 4-2314-72-10 HORSES & GOATSFOR SALE Charlie 352-278-1925 4-23-72-10 BOOKS: First came physical changes, spread by recombinant DNA in viruses. Then came the memories. WONDERS AND TRAGEDIES, a science fiction novel, is by Alan Kovski. Available via Amazon.com 2-28-14-12-10 BOOKS: A wilderness may be prowled by creatures of the forest. Or it may be urban, highly cultured, and just as deadly. WILDERNESS, a science fiction novel, is by Alan Kovski. Available via Amazon.com 2-28-14-12-10 BOOKS: What will we become, years from now? Better or worse? Fools, victims, fortunate souls, survivors in dangerous times? REMEMBERING THE FUTURE: science fiction stories by Alan Kovski. Available via Amazon.com 2-28-14-12-10TENOR SAXPaid $2000. Asking $1000 Call 352-529-0259 2-19-14-3-10 Alligator Classifieds is the way to get your 2 wheels on the road. Show off your bikes, scooters, and repair services. Call 373-FIND to get your classified in. 4-23-14-72-11 NEW SCOOTERS 4 LESS Great Scooters, Service & Prices! 118 NW 14th Ave, Ste D, 336-1271 Vespa, Genuine, GMW, & More! NS4L.com facebook.com/newscooters4less 4-23-14-72-11 SCOOTER REPAIRNew Scooters 4 Less has LOW repair rates! Will repair any make/model. Close to UF! Pick-ups avail. Cheap oil changes!! 336-1271 4-23-14-72-11 Road Rat Motors Largest Scooter Store in Town! Run by Gator Grads! New scooters starting at $999. 1-2yr warranties with roadside assistance includ ed. 376-6275 RoadRatMotors.com 4-2314-72-11 Road Rat Motors offers FREE pickup service for any paid scooter repair. LOWEST labor rate, quickest turnaround in town! Will repair ANY brand scooter. Free estimates. 3766275. RoadRatMotors.com 4-23-14-72-11 SCOOTER RENTALSRent for a day, week, month or semester. Now renting Buddy scooters too! 352-336-1271 www.gainesvillescooterrentals.com 4-23-14-72-11 Campus Scooters Mobile Sales and Scooter Service. We offer free estimates on all repairs and we come to you. We also have new scooters starting at $799.00 Call us today at 352-263-0425 4-23-14-72-11 WWW.SWAMPCYCLES.COM Scooters & Motorcycles Sales & Service Quality, Experienced, Certified Technicians. Close to Campus, Lowest Prices. 633 NW 13th St. 352-373-8823 4-23-72-11ccmotorcycletraining.com2 days $150 weekdays or weekends G-ville/ Starke 352-331-0131 train on motorcycles or scooters State certified Co & Trainers 3-1414-20-11 Unload your lot. Sell your cars through Alligator Advertising for cheap. 373-FIND or place your ad online at www.alligator.org/ classifieds CARS CARS BuySellTrade Clean BMW, Volvo, Mercedes Toyota, Honda, Nissan cars 3432 N Main St. www.carrsmith.com CARRSMITH AUTO SALES 373-1150 4-23-72-12 We Buy Junk Cars Trucks, Vans Titled only Call KT 352-281-9980 or 352-215-3191 4-23-72-12 SUN CITY AUTO SALES $0 DOWN!!! FILE YOUR TAXES HERE AND DRIVE HOME TODAY 352-338-1999 4-23-72-12 SUN CITY AUTO SALES ALL VEHICLES $0 DOWN NO CREDIT CHECK!! NO EMPLOYMENT CHECK 352-338-1999 4-23-72-12 SUNRISE AUTO SALES DOWNPAYMENT DEFERRED FILE YOUR TAXES HERE AND DRIVE HOME TODAY 352-375-9090 4-23-72-12 SUNRISE AUTO RENTALS ALL VEHICLES 2014 3630 N. MAIN ST. www.carrentalsunrise.com 352-375-9090 4-23-72-12 SUNRISE AUTO SALES DOWN PAYMENT DEFERRED NO CREDIT CHECKS!!! NO EMPLOYMENT CHECK 352-375-9090 4-23-72-12 96 OLDS ACHIEVA $1500 95 FORD EXPLORER $1500 94 CHEVY CAPRICE $1500 93 NISSAN PATHFINDER $1500 352-338-1999 4-23-72-12 93 CADILLAC SLS $1999 92 TOYOTA CAMRY $1999 91 CHEVY CAPRICE $1900 00 BLAZER $1999 352-338-1999 4-23-72-12 CASH PAID $300 AND UP!! !ANY CONDITION-RUNNING OR NOT!!! FREE TOWING & SAME DAY PICK-UP NO TITLE NEEDED. Call Steve 352-771-6191 4-23-14-72-12 Exclusive Deal For University of Florida Students Save $572* on Auto Insurance Instantly! Visit: DiscountCarInsuranceForStudents.com & enter promo-code: ufl572 2-18-14-5-12 This newspaper assumes no responsibility for injury or loss arising from contacts made through advertising. We suggest that any reader who responds to advertising use caution and investigate the sincerity of the advertiser before giving out personal information or arranging meetings or investing money. GOLD GEMS ETCFree Appraisals Top Cash or Trade 40 years in Business OZZIE 352-318-4009 4-23-72-13 UF GRAD PAYS MOREfor gold jewelry, scrap gold, Rolex, diamonds, guitars, etc. Top $$$. Get my offer before you sell! Call Jim 376-8090 or 222-8090 4-23-72-13 The American Cancer Society Road to Recovery Volunteers Needed!VOLUNTEER DRIVERS NEEDEDto transport cancer patients to treatment. Flexible schedule. Training and liability insurance provided. Please call 352-240-5062 if interested. St. Francis House is a homeless shelter and soup kitchen located in downtown Gainesville, and we are looking for help from volunteers like you. St. Francis House depends on monetary support from individual donors and community businesses in order to help feed the homeless and the hungry.If you are interested in volunteering,please contact Stephanie Breval at (352) 378-9079 or sfhcoor@stfrancis.cfcoxmail.comTo make a donation by mail,please send checks payable to St. Francis House P.O. Box 12491 Gainesville, FL 32604 CASH PAID $300 AND UP!! !ANY CONDITION-RUNNING OR NOT!!! FREE TOWING & SAME DAY PICK-UP NO TITLE NEEDED CALL 352-771-6191 4-23-14-72-13 VOLUNTEERS NEEDED I AM BLIND & WOULD LIKE HELP WITH: Rides to church: Mass at Queen of Peace. Learning to rake knit hats to send to Haiti & other places. Call 352-219-6948 2-21-14-72-13 Work on NewGov.us! Must be interested in web or UX design, programming, history and/or politics. Contact eric@buygood.us 2-24-14-7-13 Friends dont let friends drive drunk.